"It has been a busy week here at Advent. On behalf of the Call Committee and Council, I am pleased to announce that both committees have unanimously agreed on a pastor to be presented before the Advent congregation for consideration as our next Senior Pastor. The congregational meeting to vote on this pastor will be Sunday, February 26th, so we encourage as many of you as possible to be in attendance that Sunday. The candidate will participate in all three worship services, and we are working on the details as to how best to introduce this individual to the congregation. Please be looking for a letter in the mail and information in the announcement page and e-letters over the next two weeks for details. We encourage all of you to please come be part of this process on February 26th. Thank you." Stay tuned for a formal announcement from the Call Committee in next week's e-letter and in the mail, and ongoing details in this weekly e-letter and in worship. This year marks the 500th anniversary of the Reformation, so we're hosting a special event centered on a beloved pillar of Lutheran worship: the hymn. Join us in commemorating the 500th anniversary of the Reformation by raising our voices at our Reformation Hymn Sing at 7pm on Wednesday, February 22. As if he hadn’t already done enough, Martin Luther also wrote the words and music to a great many hymns, and they will be the feature of our Hymn Sing. 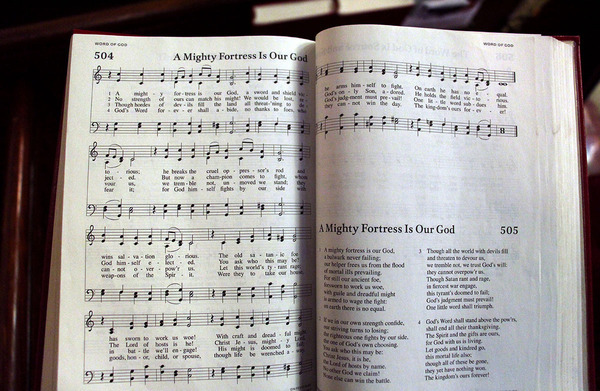 Our selection of Luther’s hymns will focus on his understanding of the Apostle's Creed. Join us singing, celebrating, and reflecting on Luther’s reformative understanding of God’s Word that laid the foundation for this wonderful faith community we are blessed with today. We are inviting other congregations and friends to this special event, and we invite you to do so too! Click here to print a flyer. The last meeting of our three-part book study on “The Forgotton Luther: Reclaiming the Social-Economic Dimension of the Reformation” led by Pastor Sudbrock is at 6:30pm this Wednesday, February 8. Even if you haven't been able to make the other meetings, or haven't started reading the book yet, you are welcome to join the discussion and pick up a copy. On Sunday mornings in February, you can also join Pastor Sudbrock for a 4-week study on Luther's Small Catechism during our Adult Conversation hour at 10:10am in the basement fellowship hall. 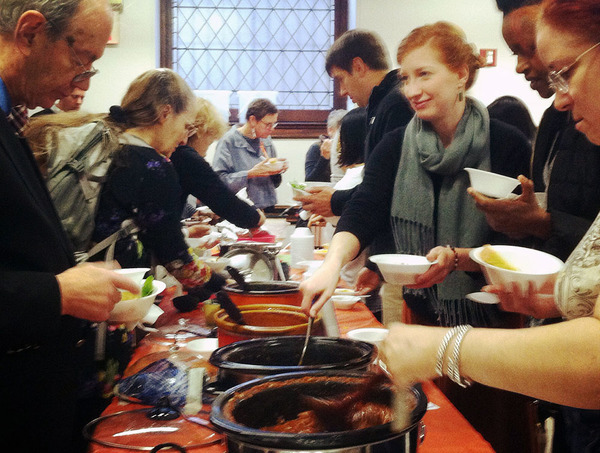 We’re bringing back our tradition of a Chili Cook-Off as a special coffee time after 11am worship. Due to our Special Congregational Meeting on Sunday, February 26, it has been rescheduled to Sunday, March 19. This year it will double as a Mardi Gras celebration, too! To enter your chili or help out, contact Maura Rosado at maurarosado@gmail.com. All are invited to enjoy a warm bowl (or bowls) of chili, and fun fellowship. 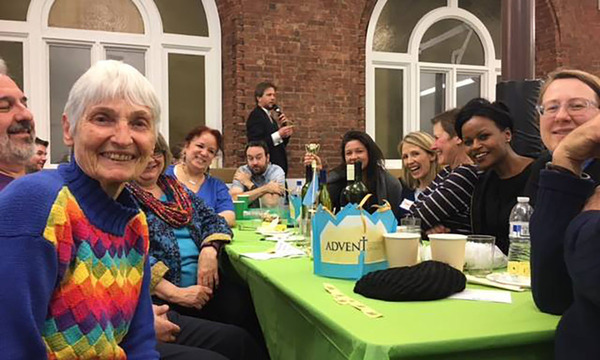 We’re getting an Advent team together to participate in the second annual trivia night fundraiser supporting Lutheran Ministries in Higher Education in NYC, aptly titled: “Are You Smarter Than A College Student?” Join our team to face off against other churches and college students in a friendly battle of wits admist food, drink, and fellowship. Whatever your level of prowess at trivia, anyone interested in being part of our team is welcome to join! Talk to our team leader, Carolyn Riehl (carolyn.riehl@gmail.com), to learn more and get on board. Last year we sent out an Advocacy Alert calling you to reach out to your Senators and Representatives about releasing the allocated funds to Lutheran World Federation's Augusta Victoria Hospital, which provides the only source of life-saving cancer treatment in Jerusalem and surrounding areas. We are pleased to share that the U.S. recently released 25 million USD for the payment of Palestinian Authority (PA) debts to East Jerusalem hospitals. Augusta Victoria Hospital (AVH) received over 11 million USD on 22 January 2017. Once again we have avoided any interruption to the life-saving cancer and kidney treatment provided by AVH. Thank you those of you who took action and gave your support. Ash Wednesday is just a month away on Wednesday, March 1. We'll have special worship services at 12pm and 7:30pm in English, and 6pm in Spanish. We invite you to worship with us and be marked with a cross of ashes. Beginning Wednesday, March 8, our Wednesday Evening Worship services return for the Lenten Season at 7pm. A change from the Advent Season, these midweek worship services will begin at 7pm, and we’ll also have a Soup Supper before at 6pm in the basement fellowship hall. 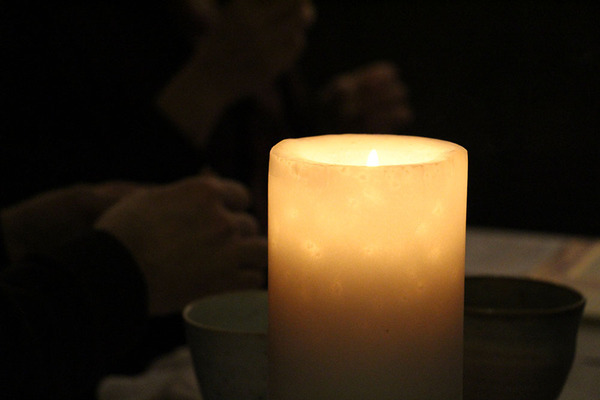 Join us each Wednesday for fellowship around warm soup, and a Taize-style worship service drawing us into meditation and reflection for Lent. If you are willing to cook soup for one our suppers, sign up here. Sunday Singers | Sings at 11am worship. Meets at 10:15am to rehearse.